Safe use of tacrolimus relies on regular whole-blood drug monitoring. Of the methods used to assess whole-blood tacrolimus concentration, antibody-conjugated magnetic immunoassay is mostly used for therapeutic drug monitoring because it requires only a minimal sample preparation and no pretreatment procedure. However, several cases recently have been reported in which abnormally false elevated tacrolimus concentrations were measured by antibody-conjugated magnetic immunoassay (>15 ng/mL), despite the absence of clinical symptoms. We present 2 cases of falsely detected tacrolimus concentrations that did not show abnormally high values within the therapeutic range. Whole-blood tacrolimus concentrations obtained by antibody-conjugated magnetic immunoassay showed well-controlled concentrations (approximately 2-8 ng/mL), whereas those obtained by another immunoassay and in washed erythrocytes were below the assay range (< 1.2 ng/mL). Thus, antibody-conjugated magnetic immunoassay can elicit falsely positive results of tacrolimus concentrations, even though they are within the therapeutic range. In our hospital, we measure tacrolimus concentrations using the Dimension Xpand Plus with the Heterogenous Module Integrated Chemistry System (Siemens Corporation, Deerfield, IL, USA). This machine adopts an antibody-conjugated magnetic immunoassay (ACMIA). Antibody-conjugated magnetic immunoassay is a method that measures drug concentrations, including tacrolimus, cyclosporine, and digoxin using a mouse capture antibody, magnetic particles, and β-galactosidase. Several studies have shown that the results of the ACMIA correlate with those of alternative immunoassays.5,6 Additionally, compared with other immunoassays, the ACMIA does not interfere with hematocrit values, and pretreatment is not required. However, in the last decade, some cases have been described in which the blood tacrolimus concentrations as measured by the ACMIA revealed falsely elevated drug concentrations in kidney, liver, and heart transplant recipients.7-10 Fortunately, the values described were remarkably toxic concentrations; therefore, health care professionals immediately noticed the abnormal values were incorrect because of the inconsistency of clinical symptoms. Unlike previous cases, we recently saw cases that showed falsely detected tacrolimus concentrations (although they were within the therapeutic range). Here, we report 2 cases of falsely detected tacrolimus concentrations that did not show abnormally high values within the therapeutic range. In March 2009, a 63-year-old woman underwent a liver transplant because of a congenital arteriovenous fistula. As treatment for baseline immuno-suppression, she had taken cyclosporine (50 mg, orally, twice daily) and mycophenolate mofetil after the transplant for more than 3 years. 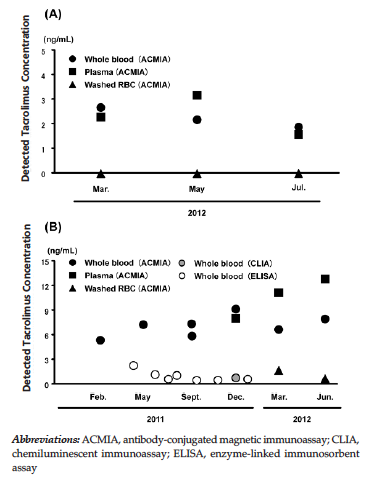 The whole-blood trough cyclosporine concentrations were maintained within 80 ng/mL. In March 2012, the physician routinely requested the pharmacist to measure the trough tacrolimus concentrations, even though she had never taken tacrolimus. The whole-blood tacrolimus concentrations obtained by the ACMIA run on the Dimension Xp and Plus Heterogenous Module system was 2.7 ng/mL (sensitivity of tacrolimus: 1.2 ng/mL; package insert). Because the pharmacist noticed this inconsistency by checking the patient’s prescription history with an electronic medical chart, the pharmacist immediately measured the whole-blood cyclosporine concentration. The whole-blood cyclosporine concentration obtained by the ACMIA was 47.3 ng/mL. Because of these events, we suspected a false detection of tacrolimus/cyclosporine concentrations by the ACMIA as shown in previous reports.7 To check false detection of tacrolimus concentration, we measured tacrolimus concentration in plasma and washed erythrocytes. The value of tacrolimus concentration in plasma and washed erythrocytes was 2.3 ng/mL and zero (Table 1), although approximately 80% of tacrolimus in blood is distributed in erythrocytes.11 In contrast, cyclosporine concentrations in plasma and washed erythrocytes were reasonable (Table 1). Thus, the whole-blood cyclosporine concentration did not reveal a false elevation. Similar results were observed for values collected between May 2012, and July 2012 (Table 1). We evaluated a 75-year-old woman who had undergone a liver transplant in August 2006 for cirrhosis after chronic infection with hepatitis C virus. After the transplant, she was treated with tacrolimus 0.2 mg, twice daily (or sometimes, 0.2 mg once a day) and mycophenolate mofetil. She has been followed at our hospital and other hospitals once a month, and the tacrolimus concentration has been monitored in both hospitals. However, the values of the whole blood tacrolimus concentration as measured by the ACMIA were different in our hospital (5-10 ng/mL) than those measured by the enzyme-linked immunosorbent assay (ELISA) in other hospitals (0.5-2.5 ng/mL) (Figure 1). Thus, we suspected false detection of tacrolimus concentration by the ACMIA. To investigate method-specific interference, we compared the whole-blood tacrolimus concentrations obtained by the ACMIA with those obtained by a chemiluminescent immunoassay (CLIA) using the same sample. Thus, the whole-blood tacrolimus concentration obtained by the ACMIA and CLIA was 9.2 and 0.8 ng/mL. Next, we measured tacrolimus concentration in plasma and washed erythrocytes; tacrolimus concentration in washed erythrocytes was considerably lower than that in plasma (Table 1). Interestingly, the cyclosporine concentration also was detected in whole blood and plasma and digoxin in plasma, which also were assayed by the ACMIA (assay sensitivity of cyclosporine and digoxin was 25 ng/mL and 0.2 ng/mL; Table 1), even though she has never taken both cyclosporine and digoxin. Similar to tacrolimus, the cyclosporine concentration in washed erythrocytes was considerably lower than that in plasma, and the digoxin concentration obtained by CLIA was within the detection limit (< 0.3 ng/mL). Immunoassays represent a powerful tool for routinely and high-throughput analyses, because quantitative determinations can be obtained with sufficient accuracy and reproducibility. Therefore, many drug concentrations, such as mTOR inhibitors, can be analyzed by the immunoassay as an alternative method to other assays including high-performance liquid chromatography.12 Antibody-conjugated magnetic immunoassay is a newly developed, fully automated assay for monitoring of therapeutic drugs such as tacrolimus, cyclosporine, and digoxin. Compared with other alternative assays such as microparticle enzyme-linked immunoassay, enzyme-multiplied immunoassay, and ELISA, this assay requires only minimal sample preparation, because the instrumentation allows automatic lysis of erythrocytes, bringing several advantages to the routine laboratory—it limits the time required for determination and reduces the need for personnel to perform the assay. Several medical institutions across the world have adopted the ACMIA for monitoring therapeutic drugs. 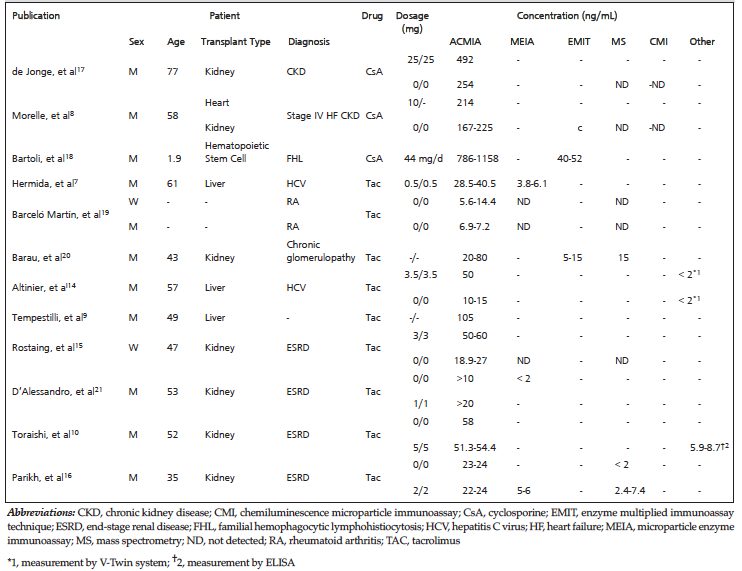 However, several cases of false abnormally elevated tacrolimus/cyclosporine concentrations measured by the ACMIA in patients who had undergone kidney, liver, or heart transplant have been reported.7-10 A literature review of falsely detected tacrolimus/cyclosporine concentrations as measured by the ACMIA is shown in Table 2. Furthermore, Moscato and associates have reported a systematic analysis of the extent of false-positive results of tacrolimus concentration obtained by the ACMIA that was observed in 10 of 1058 patients (approximately 1%), compared with that obtained by the liquid chromatography-tandem mass spectroscopy reference method.13 These reports implicated the strong possibility that in some patients, the ACMIA provides incorrect tacrolimus concentration values. With this evidence, a method for avoiding falsely detected tacrolimus/cyclosporine concentrations as measured by the ACMIA should be developed immediately. A recent publication reported an interference with tacrolimus concentrations as measured by the ACMIA because of the presence of the following factors in patient samples: heterophilic antibodies, rheumatoid factor, anti–double-strand DNA antibodies, and the antibody-enzyme (β-galactosidase).7,14-16 Although we did not investigate the reasons in detail, we estimated that the differences between the 2 cases were related to this false elevation. False detection of cyclosporine and digoxin was observed in case 2, but not in case 1. According to the ACMIA measurement principle, it is strongly speculated that false detection of cyclosporine and digoxin in case 2 was because the ACMIA interfered with β-galactosidase, and in case 1, false detection is not caused because an endogenous substitute interacted specifically with tacrolimus. Further study is required to determine the factors involved in this false detection. Based on the interference factors previously reported,7,14-16 the simplest approach to determine the nature of the observed interference involves measuring tacrolimus concentrations in plasma. In addition, the use of commercially available heterophilic blocking tubes and polyethylene glycol are other options. Furthermore, several reports have proposed estimation of whole-blood tacrolimus concentration by evaluating tacrolimus concentration in washed erythrocytes and hematocrit.7,9 However, calculating the falsely detected tacrolimus concentration is difficult, unless an apparent abnormal range is observed. The approaches mentioned above are available only to check whether tacrolimus concentrations are false-positive or not. Therefore, a useful and effectively modified ACMIA must be developed that avoids not only falsely detected tacrolimus/cyclosporine concentrations, but other drugs as well. In conclusion, to the best of our knowledge, this is the first report that reveals falsely detected tacrolimus concentrations (albeit within a therapeutic range) as measured by the ACMIA. This is despite the fact that apparent falsely elevated tacrolimus/cyclosporine concentrations have been previously reported. The cases described here should raise the physician’s concern because the ACMIA is associated with the potential hazard of false-positive results of tacrolimus concentrations even though they are within the normal range. Tanaka H, Kuroda A, Marusawa H, et al. Physicochemical properties of FK-506, a novel immunosuppressant isolated from Streptomyces tsukubaensis. Transplant Proc. 1987;19(5 suppl 6):11-6. Laskow DA, Vincenti F, Neylan J, Mendez R, Matas A. Phase II FK 506 multicenter concentration control study: one-year follow-up. Transplant Proc. 1995;27(1):809-811. Porayko MK, Gonwa TA, Klintmalm GB, Wiesner RH. Comparing nephrotoxicity of FK 506 and cyclosporine regimens after liver transplantation: preliminary results from US Multicenter trial. U.S. Multicenter Liver Study Group. Transplant Proc. 1995;27(1):1114-1116. Fung JJ, Alessiani M, Abu-Elmagd K, et al. Adverse effects associated with the use of FK 506. Transplant Proc. 1991;23(6):3105-3108. Ju MK, Chang HK, Kim HJ, et al. Is the affinity column-mediated immunoassay method suitable as an alternative to the microparticle enzyme immunoassay method as a blood tacrolimus assay? Transplant Proc. 2008;40(10):3673-3678. Ventura E, Bonardet A, Pageaux GP, Mourad G, Cristol JP. Calcineurin Inhibitor Determination in Whole Blood With the RXL Dimension Analyzer: A Useful Tool for Immunosuppressive Drug Monitoring. Transplant Proc. 2009;41(2):707-709. Hermida J, Tutor JC. Falsely increased blood tacrolimus concentrations using the ACMIA assay due to circulating endogenous antibodies in a liver transplant recipient: a tentative approach to obtaining reliable results. Ther Drug Monit. 2009;31(2):269-72. Morelle J, Wallemacq P, Van Caeneghem O, Goffin E. Clinically unexpected cyclosporine levels using the ACMIA method on the RXL dimension analyser. Nephrol Dial Transplant. 2011;26(4):1428-1431. Tempestilli M, Comandini UV, Vennarecci G, Pucillo LP. Whole blood levels evaluation measuring tacrolimus by ACMIA method on washed erythrocytes in a liver transplant recipient with circulating heterophilic antibodies. Clin Chim Acta. 2011;412(15-16):1480-1481. Toraishi T, Takeuchi H, Nakamura Y, et al. Falsely abnormally elevated blood trough concentration of tacrolimus measured by antibody-conjugated magnetic immunoassay in a renal transplant recipient: a case report. Transplant Proc. 2012;44(1):134-136. Zahir H, McCaughan G, Gleeson M, Nand RA, McLachlan AJ. Factors affecting variability in distribution of tacrolimus in liver transplant recipients. Br J Clin Pharmacol. 2004;57(3):298-309. Pieri M, Miraglia N, Polichetti G, Tarantino G, Acampora A, Capone D. Analytical and pharmacological aspects of therapeutic drug monitoring of mTOR inhibitors. Curr Drug Metab. 2011;12(3):253-267. Moscato D, Nonnato A, Adamo R, Vancheri M, Caropreso A. Therapeutic monitoring of tacrolimus: aberrant results by an immunoassay with automated pretreatment. Clin Chim Acta. 2010;411(1-2):77-80. Altinier S, Varagnolo M, Zaninotto M, Boccagni P, Plebani M. Heterophilic antibody interference in a non-endogenous molecule assay: an apparent elevation in the tacrolimus concentration. Clin Chim Acta. 2009;402(1-2):193-195. Rostaing L, Cointault O, Marquet P, et al. Falsely elevated whole-blood tacrolimus concentrations in a kidney-transplant patient: potential hazards. Transpl Int. 2010;23(2):227-230. Parikh BA, Siedlecki AM, Scott MG. Specificity of a circulating antibody that interferes with a widely used tacrolimus immunoassay. Ther Drug Monit. 2010;32(2):228-231. Erratum in: Ther Drug Monit. 2010;32(4):528.
de Jonge H, Geerts I, Declercq P, et al. Apparent elevation of cyclosporine whole blood concentrations in a renal allograft recipient. Ther Drug Monit. 2010;32(5):529-531. Bartoli A, Molinaro M, Visai L. Falsely elevated whole blood cyclosporine concentrations measured by an immunoassay with automated pretreatment. Ther Drug Monit. 2010;32(6):791-792. Barceló Martín B, Marquet P, Ferrer JM, et al. Rheumatoid factor interference in a tacrolimus immunoassay. Ther Drug Monit. 2009;31(6):743-745. Barau C, Frangie C, Goujard C, et al. Falsely elevated whole blood tacrolimus concentrations due to interference in an affinity column-mediated immunoassay method on Xpand dimension. Ther Drug Monit. 2009;31(2):267-268. D'Alessandro M, Mariani P, Mennini G, Severi D, Berloco P, Bachetoni A. Falsely elevated tacrolimus concentrations measured using the ACMIA method due to circulating endogenous antibodies in a kidney transplant recipient. Clin Chim Acta. 2011;412(3-4):245-248. Acknowledgements: The authors declare that they have no conflicts of interest, and they received no funding for this study.